When I started my career, digital marketing was simple. Marketing was not ‘automated’, social media wasn’t so popular, and ranking on Google was easy! That was 14 years ago, a lot has changed since then. Today dozens of new products are launched every day, and in the recent past marketing technology options have increased from around 150 in 2011 to over 3500 in 2016. For every small need, there are hundreds of tools available today. For example, if you need social media marketing software and search on Capterra, you’ll find over 200 options. One word describes the online tool industry: explosive. When a few options are available, it’s easy to choose a solution for your needs (or settle for whatever is available, since there is nothing more you can do). But, when over 3500 options are available, it’s far more difficult. Marketing Automation Software could be the Solution! But wait a minute, where are all of the features? What if you could just integrate your tools the way you want! 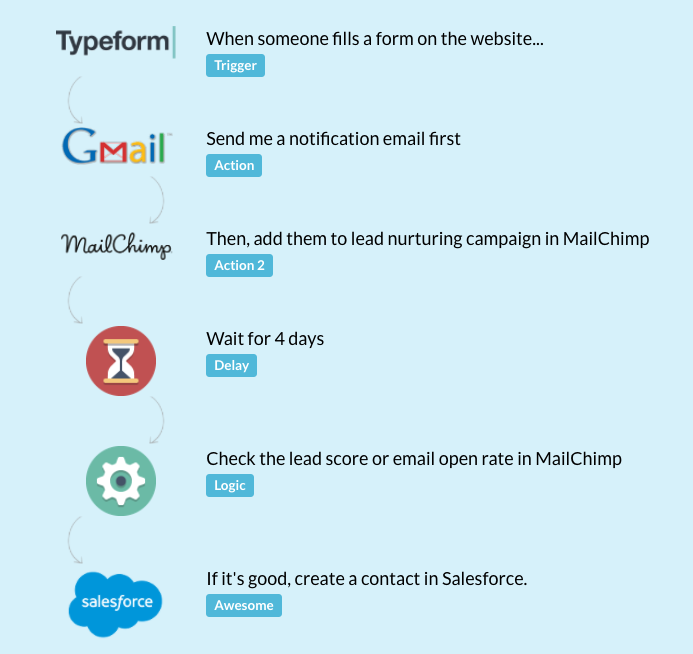 Can Integration tools really run my marketing/sales process? Even though there are many options for tools this doesn’t mean it is a bad thing. This way you can choose the tool that is a perfect match for what you need to do. Hundreds of choices make it difficult to decide, but once you’ve gone through the research and comparison phases of finding the best tools for what you need, you are good. Let’s say you start by deciding you need to collect email addresses on your website and send them newsletters – simple. So research and get MailChimp. Now you realize you need a better form on your website and get Typeform. Then, you need to be social, so you join Buffer. This goes on and on, and you are now logging into several tools, looking up data, moving leads between them, and it started becoming a mess. 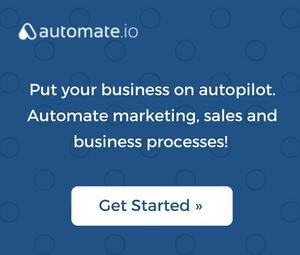 With all of this going on, your business grows and you come to the point where you can afford an all-in-one marketing automation product. You evaluate a few and get one that has email marketing, social media tools, forms and more. Finally, you say, everything is in one place. No more juggling between apps… no more import and exports. Sure you can post to social accounts from your all-in-one product, but you can’t add a queue of 100 messages that just automates itself like you would on Buffer. Now you look at your forms and realize they aren’t nearly as nice as ones in Typeform. And you are missing a lot of functionality from your WordPress plugins. 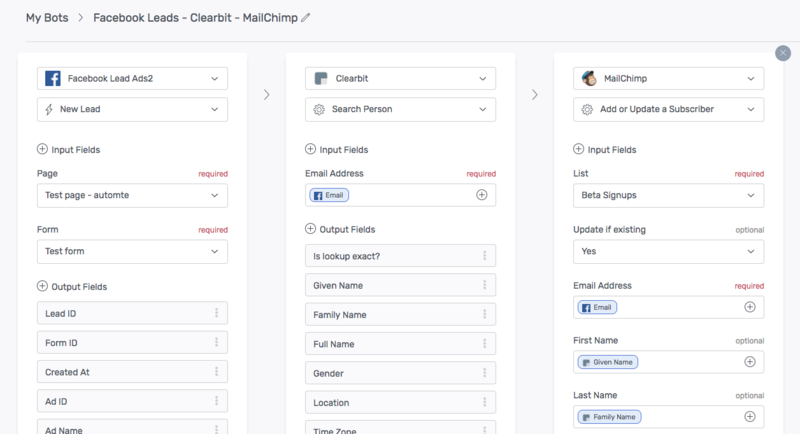 Further, MailChimp integrated with everything but your new All-in-one does not, so you still need other tools to help you make the connections. What it all comes down to…. All in one marketing tools don’t live up to their hype. They are like sedans put on the racetrack, they come in laps behind, and can’t perform against the best. Well… is there a really a solution to this then? What was the issue with using multiple tools you really liked? Data silos – resulting in information and productivity loss. Integration tools (like Automate.io) solve precisely this problem. Move data between apps, in real-time want, the way you want. Yes. One tool to rule them all. These tools allow you to connect your web applications in ways you never thought possible. In fact, the biggest thing holding them back is there are so many options for integrations and each use case is so personalized it’s difficult to show the world everything they can do. Here’s a glimpse of the kind of integration workflows possible. You can embrace the expert tools you want, like Hootsuite, MailChimp, Buffer, Unbounce, Typeform, Drip, Google apps and others to have access to all of the awesome features that keep your company ahead of the game, while exchanging data between applications. Isn’t it hard to set up the integration and manage them? While tools like Automate.io don’t require you to have any technical knowledge, you do need to understand what precise data you need where and how to set up the data flow. We’ve discussed two different approaches to address your marketing tool/data chaos. 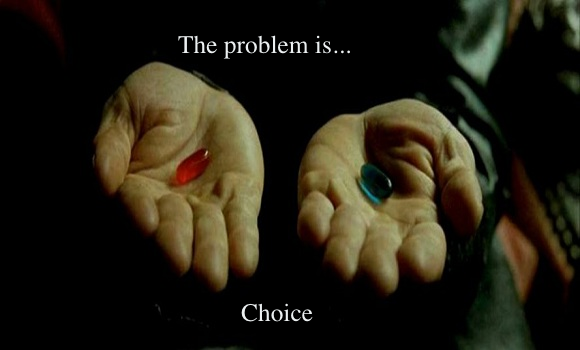 There is no one choice that fits all. You’ll have to decide what is best for your company based on your needs or choose a middle path. Let’s see how the two approaches fare on different fronts. While they offer a lot of features, they don’t tend to match up on the quality front. Yes. You can choose the individual tools you love. All customer data at one place Yes. This is a big advantage. Having all customer data at one place does really help. No. But it is possible to get the data in one central app (CRM) through integrations. Business workflows & automation Limited. If at all possible, it is very limited to the tool being used. Excellent. Build crazy workflows & automation across your best tools. Not everyone in your team needs all those features. All tools crammed into one make it bulky and complicated. Yes. Each of your team members only uses the tools they need. You will need to know how to set up the integration/workflows though. Marketing automation products are known to break your bank. They come with all the set of tools you may or may not need. Depends. While Integration tools aren’t expensive themselves, you will still need to pay for the individual tools you use. If you don’t need the best of features, and badly need all your customer data in one place, an all-in-one MA solution may be a good fit for you. However, if you have the technical inclination, you can use integration tools and make sure your customer data is accumulated in one place – typically your CRM or email marketing product. If you are able to achieve that, the integration route may work best for you. If you have the know-how, you can do far better process automation than what all-in-one products do. Let me explain how it could work for you, just to help you see the possibilities. Here is one workflow you may use. It’ll take your own creativity to decide what integrations you need, but looking at the options available in our platform will spark ideas. 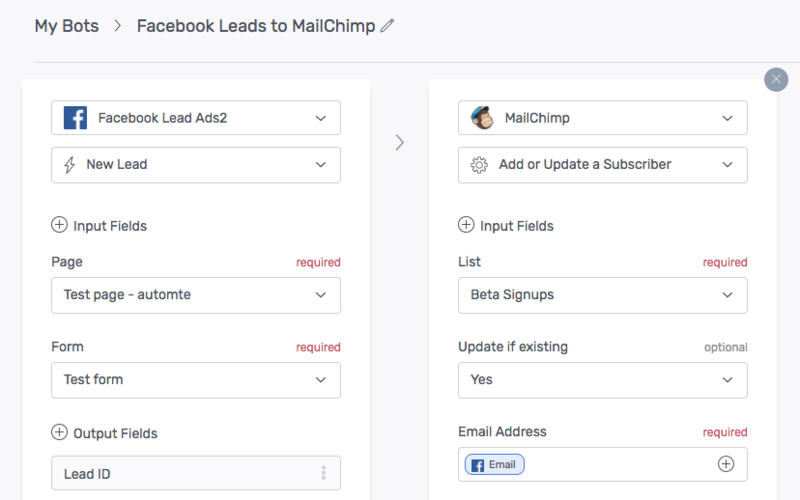 Let’s say you run Facebook Ads to generate leads, and want to transfer them to your email marketing tool – MailChimp. Setup an integration like this. Now we all know that leads aren’t likely to give us a lot of information in a form, but you wish you had more information so you send more personalized and targeted emails. Data enrichment services like Clearbit or FullContact provide you precisely the same. You can now enhance your integration and include one of them. Once your leads have been nurtured and are ready to move to sales (you’ll have to select the triggers for this) you can automatically import them into your favorite CRM. All of the data that was previously collected can be imported so that your sales team will know as much as possible about each lead such as what emails they opened, their interest levels, content viewed, etc. Along the way, you might want to also set up notifications to see each and every action taken for each lead, and these can be collected in one place for future reference as well. For instance, you can set up a notification in your Slack sales channel, when the lead gets transferred to your CRM. The possibilities are endless. Get started. Marketing automation is changing; daily and we digital marketers need to stay up-to-date on what features and options are available for our clients and companies. One way to do this is to trust marketing automation tools that make integrations seamless while we use the best tools possible. Marketing all-in-one tools just don’t have the functionality we need, and probably never will. We are experts, after all, we need the expert tools to stay ahead.